The level of osteotomy of the upper tibia can be above or below the tuberosity. When performing the osteotomy, Dr. Paley will always consider the center of rotation of angulation (CORA). The CORA is almost always at the joint or just below it. 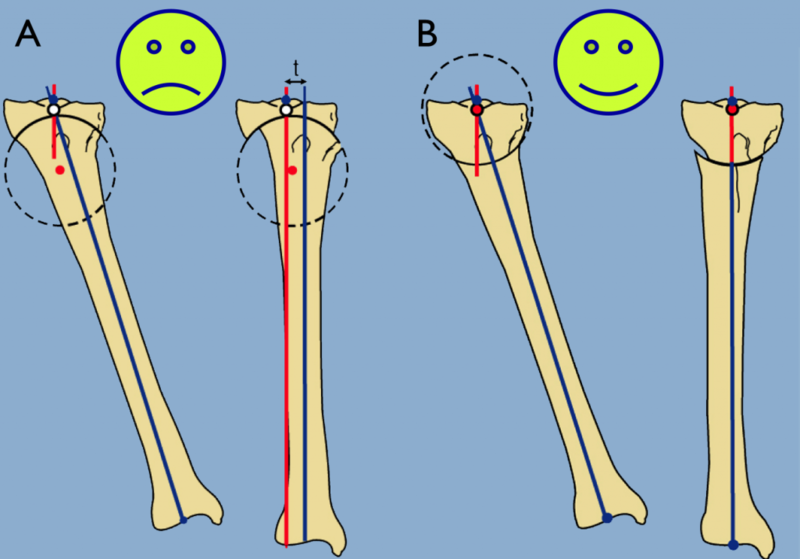 Therefore, if the osteotomy is made above the tuberosity, only angulation is required. If the osteotomy is performed below the tuberosity, angulation and translation is required. 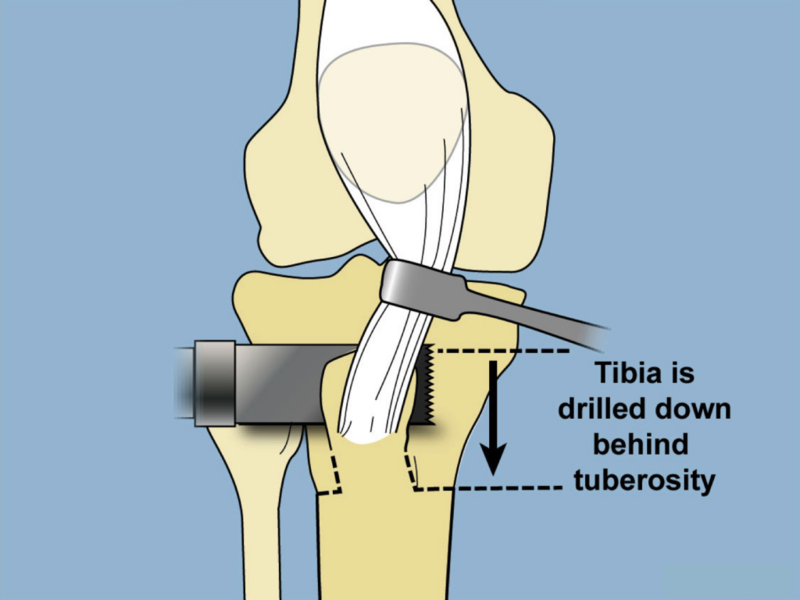 Osteotomy above the tuberosity, a closing wedge osteotomy narrows the distance between the joint and the tibial tuberosity, making future TKR more difficult. Opening wedge osteotomy tightens the medial collateral ligament (MCL), which is often lax due to the loss of space in the medial joint. An opening wedge requires a bone graft or application of an external fixator for bone regeneration. To avoid this, Dr. Paley will perform a half-closing, half-opening wedge correction, in which a half-wedge on the lateral side is resected and used as a graft on the medial side. Osteotomy below the tibial tuberosity needs to be performed in combination with lateral translation. Dr. Paley prefers a focal dome osteotomy, a circular cut in which the center of the circle is at the CORA. This differs from the Maquet osteotomy, where the center of the circle is below the CORA, resulting in a medial translation deformity. The most common complaint with MCOA is anterior knee pain, not medial knee pain as might be expected. The anterior knee pain is caused by anterior impingement and fixed flexion deformity (FFD) of the knee. FFD is more common than often realized in MCOA and may be the primary cause of realignment surgery failure. FFD must be confirmed with x-rays. Various factors can contribute to FFD, including osteophytes (bony outgrowths that result from cartilage degeneration in joints). These osteophytes will typically need to be resected during correction. To treat the FFD, extension of the proximal tibial plateau to a maximum posterior distal femoral angle (PDFA) of 90° should be performed. Greater degrees of flexion can be corrected with a distal femoral extension osteotomy. The medial collateral ligament (MCL) can be lax or contracted from loss of cartilage in the medial compartment. In the case of contracted MCL, the osteotomy should not further stretch the MCL. In the case of lax MCL, the osteotomy should be used to tighten the MCL (see opening wedge osteotomy above). If the MCL is not tightened, knee instability will occur and the patient will feel wobbly and unsteady on their knee, even in the absence of pain. An alternative method to the one described above is a hemi-plateau elevation. Lateral collateral ligament (LCL) laxity is commonly associated with MCOA. LCL laxity is not corrected with realignment of the tibia or femur alone. LCL tightening can be performed independently of or in addition to a tibial osteotomy. Dr. Paley tightens the LCL with gradual transport of the proximal fibula with an oblique osteotomy of the fibula. Left: An example of LCL laxity as a sequelae of Coventry osteotomy fused with a lateral plate. 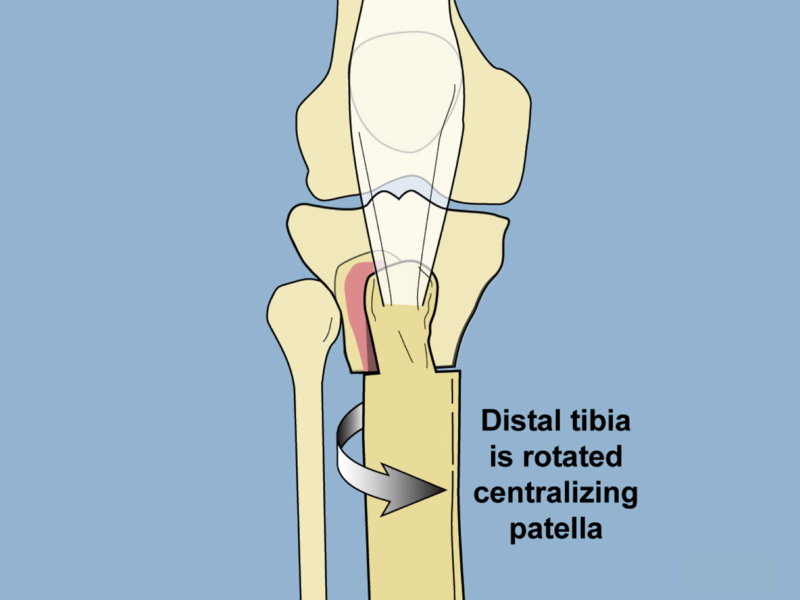 The proximal tibiofibular joint was resected and the fibula head migrated proximally and fused to the tibia. 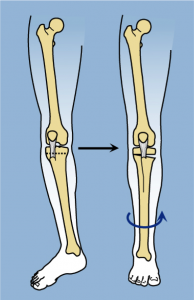 Right: The proximal tibiofibular joint was osteotomized and the fibula transported distally acutely and fixed with a screw. 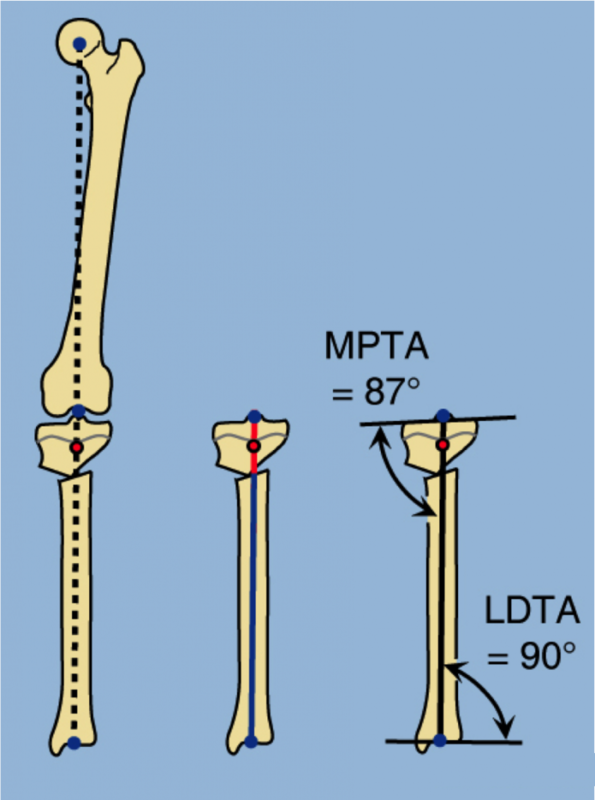 The normal plateau of the tibia has a 10° posterior tilt. In the treatment of MCOA in combination with anterior cruciate ligament (ACL) insufficiency, Dr. Paley extends the tibia to eliminate the posterior tilt, in combination with a valgusizing osteotomy. The reason for this is that in normal gait the tibia subluxes forward with each step. 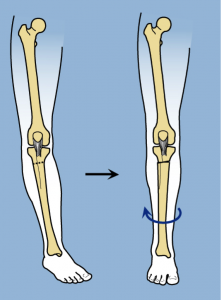 By eliminating the posterior tilt, the plateau of the tibia goes backwards (into recurvatum) during gait; this causes the femur to move forward on the tibia, countering the ACL insufficiency. Dr. Paley prefers to perform the osteotomy below the tibial tuberosity as it is easier and more reliable than osteotomy above the tuberosity. Lateral subluxation (partial dislocation) in the absence of severe bone loss of the medial tibial plateau can be treated by tightening the MCL and LCL together with realignment. If no plateau depression is present, Dr. Paley will perform a varus osteotomy of the femur in combination with a valgus osteotomy of the tibia. When lateral subluxation is present together with medial plateau depression, the knee is often very unstable. Elevation of the medial plateau is performed from a medial incision and fixed with cannulated large-diameter screws from the lateral side. The opening wedge is filled with a bone graft (or allograft or autograft). Elevation leads to immediate stabilization of the joint and can be combined with LCL tightening. Medial plateau depression is diagnosed by drawing a line across the medial plateau toward the lateral plateau. If they are on the same line, the medial plateau is not depressed. If the medial plateau passes above the lateral plateau, it is depressed. Rotational deformity can be performed simultaneously with varus realignment. 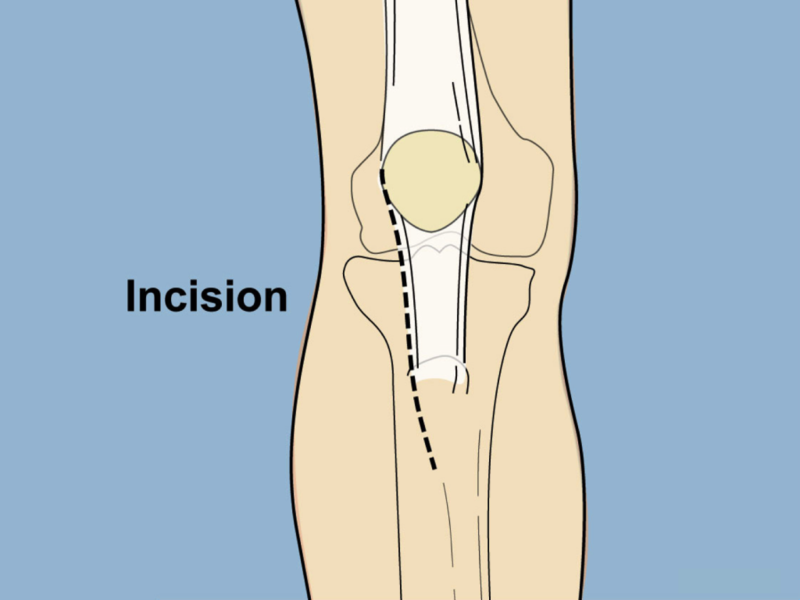 Determination of the location of the osteotomy will depend upon whether there is patellar maltracking present or not. 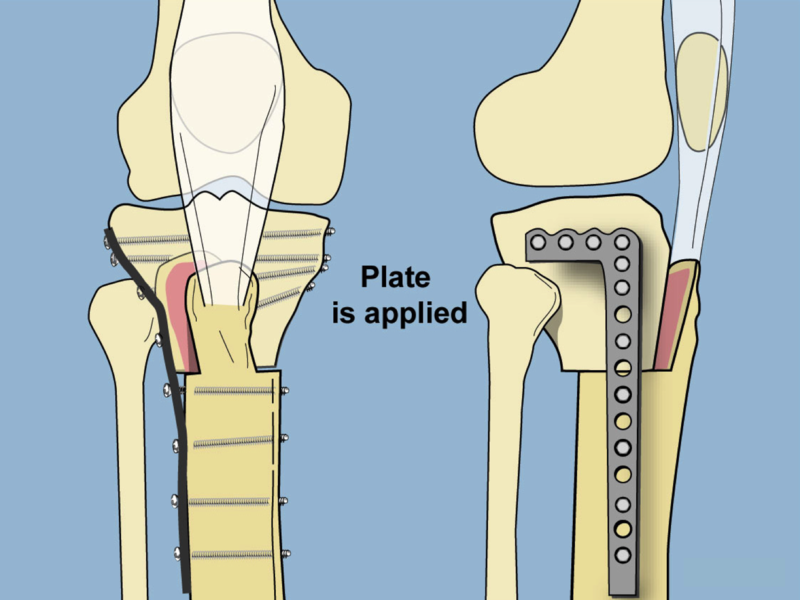 If there is no patellar maltracking, the osteotomy is performed below the tibial tuberosity. If patellar maltracking is present, the osteotomy is performed above the tibial tuberosity. In these cases, Dr. Paley performs an L-shaped osteotomy to facilitate patellofemoral realignment together with rotational correction. Treatment for Lateral Compartment Osteoarthritis (LCOA) follows considerations similar to those of Medial Compartment Osteoarthritis (MCOA). As in MCOA the location of the deformity and the presence of ligament laxity are important considerations. LCOA is more commonly related to femoral deformity than tibial deformity. Dr. Paley will correct LCOA to a neutral mechanical axis, unlike in MCOA, in which treatment shifts the mechanical axis into valgus to put more load on the lateral compartment. The reverse is not done in LCOA correction since in a normal knee the medial compartment bears 70% of the load. It would not be safe to increase load on the medial compartment. Correction of the LCOA stretches the peroneal nerve. This may lead to nerve injury and/or compartment syndrome. Therefore, correction is limited to small deformities using a closing wedge osteotomy. In larger deformities, peroneal nerve decompression and compartment fasciotomy are performed to protect the nerve and prevent compartment syndrome respectively. Osteoarthritis in the patellofemoral compartment results in patellar maltracking and torsional deformity. Dr. Paley developed an L-shaped osteotomy to facilitate patellofemoral realignment together with rotation correction, and frontal and sagittal plane corrections. In addition to rotation and angulation, this osteotomy can be translated in the sagittal and/or frontal planes. Translation in the sagittal plane unloads the patellofemoral compartment without producing a bump, as is produced with the Maquet osteotomy. This is because the tuberosity remains in the same line as the anterior cortex of the tibia. This allows patients to kneel without pain. First, Dr. Paley performs an incision to allow for a lateral release. A saw is then used to cut the frontal plane behind the tibial tuberosity. 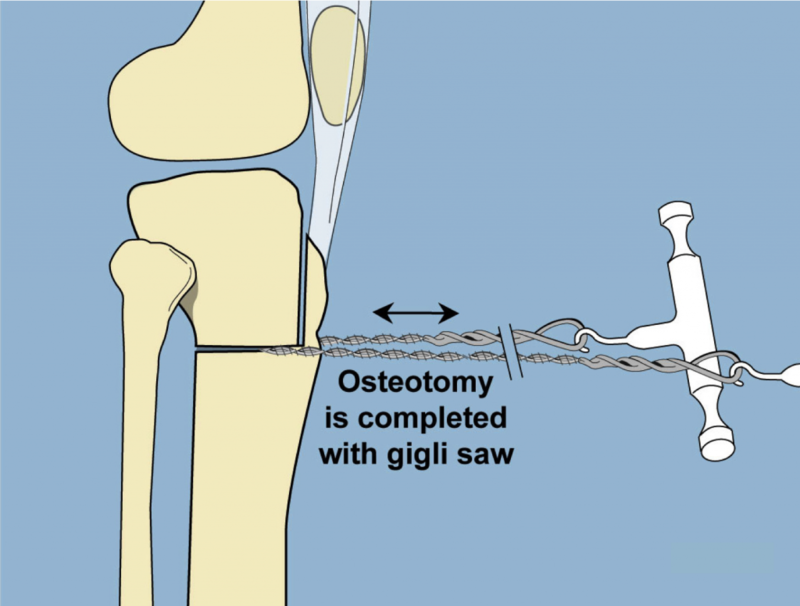 Next, a Gigli saw is used to complete the L-shaped osteotomy below the tuberosity. The tibia is rotated internally, and the tuberosity displaced medialy and anteriorly. This new alignment is fixed into place with a locking plate. The tibia can be displaced anteriorly, as weith a Maquet osteotomy, without a resulting anterior bump. Joint preservation surgery via osteotomy for Mono-Compartment Osteoarthritis of the knee has become less common as Knee Arthroplasty and Total Knee Replacement (TKR) are increasingly performed in patients of younger ages and for milder cases of arthritis. 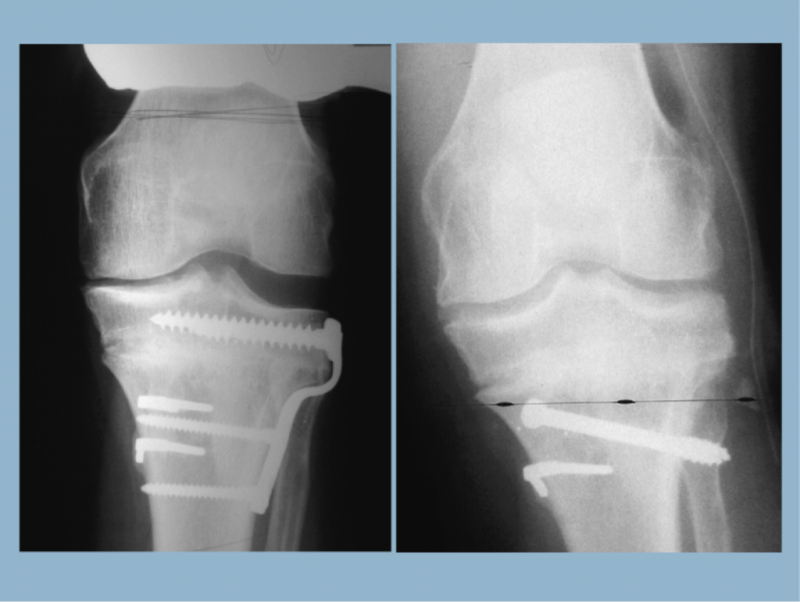 Osteotomy lost its popularity after it was shown that conversion to a TKR yielded worse results after a Coventry osteotomy. However, as we have demonstrated, the Coventry osteotomy is only one of many types of High Tibial Osteotomies (HTOs). The Coventry approach only addresses varus deformity and is contraindicated in the presence of flexion, subluxation, and bone loss. The Paley Method approaches treatment on a case-by-case basis and allows treatment of all the elements of deformity. It follows the principles of knee replacement surgery: balancing the soft tissues and realigning the bones. Based on his experience, Dr. Paley has found that his method reliably prolongs the life of the knee for 10 to 20 years.